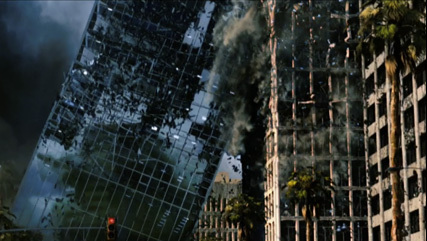 Co-Producers/Visual Effects Supervisors Volker Engel and Marc Weigert, give us a look at the colossal effects in destroying the world for Roland Emmerich’s 2012. 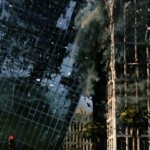 How did you get involved in the making of Roland Emmerich’s 2012? Volker Engel: It was in 1988 when I met Roland in Stuttgart while I was studying graphic design. I started working on he is last movie he did in Germany, which was called Moon 44; it was only a very small three million dollar picture. 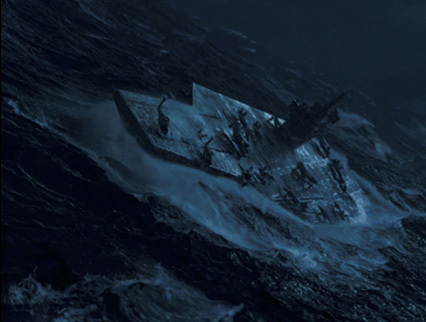 I became Visual Effects Supervisor on that picture, I started as a model maker and three months later I supervised the whole film, which was great. That was my entry as Effects Supervisor in to the industry on my first movie. Then I did Universal Soldier with him, not Stargate I went back kept on studying, finished my studies in Germany. I went to a film school where Marc and I met. Then Roland called me up to supervise Independence Day, that’s when I moved over. Marc was already in the United States at this point. Marc Weigert: We met at film school, originally I was studied producing and directing. That was just the time when our film school got five brand new silicon graphics work stations with Alias Wavefront version 3.2 or what ever the Hell it was. It was when Terminator 2 was released and I thought I have to learn that [vfx], that’s really cool. It would give me an edge later as a producer or director or whatever. We did not even have a teacher over there yet, so they said, “Here are the manuals, ” – stacks about this big – and said “knock your self-out.” I sat there day and night with those manuals while Volker was doing a stop-motion movie next door. So we were always the two that stayed late at night and that is how we became friends. Eventually I decided to come over to the States to learn more about screen writing, since I felt the European Auteur movie weren’t really my thing, so I thought I have to go, somewhere else to learn that. I was there for a year and then Volker came over and said hey I want you on board we are doing Independence Day, I thought sure why not? Engel: I talked to Roland; we were looking for people more on the organizing side. I told him I know just the right guy and he is here in LA! Marc became Project Manager for visual effects on Independence Day, and I was one of the two Visual Effects Supervisors together with Douglas Smith. 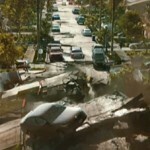 On 2012 you’re both co-producers as well as visual effects supervisors? Weigert: Yes, it’s something that really came out of the history we started in ’99. To open our own production company, Uncharted Territory. Engel: There was no discussion about us becoming co-producers. It was us coming on board as co-producers and visual effects supervisors. How much interaction did you guys have the other studios that worked on 2012? Engel: A lot of interaction with the other effects houses, we had out own in-house set up with our own company Uncharted Territory. We did the bulk of the work 422 that we did in house out of the 1315 shots that the movie has. Then the rest of the shots were divided up between the 14 other houses that we work with. There were really like 5 or 6 main houses and then there were the other houses that did like 5 or 12 shots. Weigert: The scope of it varied on depending on where they were. Engel: We were the hub, that was the important thing. After handling the bulk of the shots and supervising how they’re handling it at the other studios, what became the most challenging shots that you had to deal with? Weigert: Two sequences, one was the water mass rushing through the Himalayan Mountains. You have enormous scale and water. Scanline handled that and it was believed that because of their propriety system that they were the only ones that could pull that off in such a short time, with such a short turn around. Engel: From the get-go you know once you start discussing this like world wide two or three companies could handle something like that. Weigert: The second one: the early earthquake is split into two parts, one was an in house sequence. 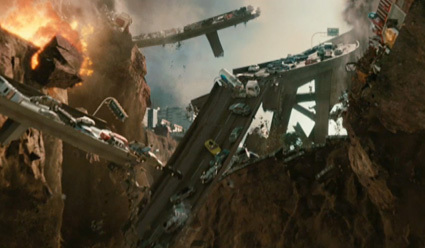 Where they would drive a limo through earthquake as everything is breaking apart and moving and falling. The second part done by Digital Domain where we taking the Cessna plane and flying through a chasm that opens up and eventually through downtown as it’s crumbling. Those two were for sure the most challenging scenes in the movie. 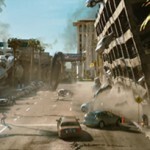 Engel: The earthquake sequence was so challenging because in the screenplay it was about three lines! They are running out of the house and into the limousine as the house was crumbling around them. They are going towards the freeway, go take the freeway then the freeway crumbles… and pretty much at the airport they arrive; which became a 114 shots in three minutes. It was three-minute sequence in the movie and it was very organic. We worked with Roland -not really while we were making the CG shots- but very early before we started while we were doing pre-visualization on it. It just became a pre-vis sequence that was so minute in detail that if you play it side by side with actual film it was ninety-five percent the same. We were happy to have a director, who doesn’t come to set and reinvent the whole thing after we did the pre-vis for several months. He actually shoots the pre-vis. That of course is a dream come true for us. Were there any shots that had to be cut due to time? Or money restraints? 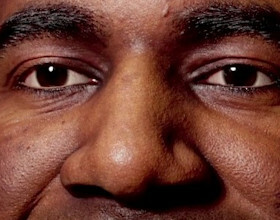 which you wanted to make it into the final cut? Weigert: While you are working on the shots you get stopped because the editor decides to re-cut it. However it was not an entire scene which is sometimes the case, so we wont have any of that for the DVD unfortunately. Fortunately everything for us is in [the theatrical release]. Engel: That is so typical for Roland; it was the same way for Independence Day. The studio came later and said hey we want to do the director’s cut and the extended version and so where are all the visual effects that were not finished? And we said we didn’t have any. There was one shot with a bus that was crashing through a Stargate billboard. It was not composited in it was just a single model shot that we did. Once it was actually cut in we all looked at it. 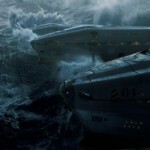 It was in the middle of a serious destruction sequence, where people’s lives were at stake. All of a sudden it was this finy moment of this bus crashing through a Stargate billboard and it was just not working. You did not want to laugh at that moment. Weigert: All the decisions to edit the shots are usually done while we are in the post-vis stage or the shots are about to be built and then the editorial finds out the pacing doesn’t work out one hundred percent or like in this one it doesn’t quite fit in there because it’s too funny or too serious or what ever. It’s really just little shots here and there, but nothing that we wish we could have done and didn’t do. Really everything we planned and wanted is in the movie. Engel: For example, the freeway breaks down and there is a cement truck rolling down and it’s crashing into a gas station. Originally there were two more shots but there were at least one more where you’re looking out the back of the limousine window and you see the fire still going and shooting over the street. That was detailed in pre-vis but didn’t go much further than that. Did you have any political problems when destroying other cities? There are a lot of famous monuments that get trashed in the movie. Did it present any problems for clearances? Weigert: Yeah, the clearances were always a fun story, because the studio of course is always afraid of that. That did make us change a few things but they were very minor changes. There are some obvious Las Vegas buildings the Vin, two towers. For instance, the Wynn casino, we went back and forth on, and it was a V and an N and we ended up changing some name on some buildings to not get into these kind of problems. Overall the consensus with that is also with the lawyers actually they say, they can only really sue you if you single out certain things. Let’s say for instance you don’t destroy anything in LA but this one single building; they can say, ‘oh you really want to hurt us.’ However we are destroying absolutely everything, so they can’t all possibly sue us for destroying/singling them out, because it’s literally almost everything gets destroyed. We didn’t have much of a problem there except for a few minor changes. 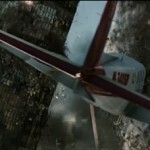 Digital Domain did a lot of work for the earthquake Cessna escape sequence. Could you give us an overview of other studios work on 2012? Engel: Scanline. They also had two other sequences that they did in the third act of the movie the flooding in the Himalaya, that’s a huge sequence that was the bulk of the work. Then there is Washington DC, where you see in the trailer the shot of the John F. Kennedy [aircraft carrier] rolling towards it and then destroy it. That is a Scanline sequence. In India there is a huge mile high wave rolling over India and that is another sequence they made. Double Negative in London did the Yellow Stone sequence, from the start where Charlie the Woody Harrelson character and John Cusack are meeting on the top of the hill. The entire caldera explodes and they get chased by the ash cloud and firebombs raining and pieces of landscape falling down as they are trying to get to their plane to get out of it. They are some fantastic shots in that too and a lot of them are in trailer. 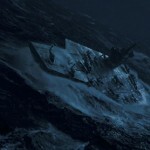 Engel: While we’re at it, Sony Imageworks did about a hundred and fifty shots of all the stuff and also in the last third of the movie these giant ships and the places where they were constructed that don’t include any water. Scanline took over for the point where the water comes in. Beyond that it is Scanline and everything before that is Imageworks, for example. 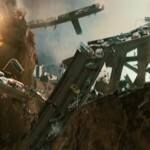 Pixomondo did allot of crash scenes, they did alot of pre-vis for us. 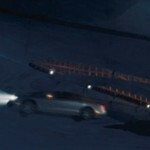 They also did a whole finished sequence for us, where the Russian transport airplane crash lands onto a glacier. Hydraulx did several sequences throughout the movie. Weigert: Starting from the very beginning with the large solar eruptions, part of the cruise ship sequence and the very end actually. The breaking of the super market was one of the very first smaller destruction sequences, very intense destruction sequences. The final shots we see literally a zoom out and seeing those three arches and then open out and seeing the earth in space. With the influx of newer technology, do you find that practical effects play less of a part in movies made today? Engel: Yes, definitely, we had the discussions in the beginning, a while ago in my notes; even before I was hired I did the first break down. I had this list with all the possible miniatures. It wasn’t that much from the get-go but it was at least things or so that I figured we could do or at least augment. It was like tumbling cars or stuff like that and then it ended up being one; which was the top of the Eiffel tower in Las Vegas where the transport plane hits it. Weigert: We talked a lot about it because we love miniatures, it’s a lot of fun standing on the set and do the three, two, one and bang! The stuff really explodes; it’s so much more fun then waiting for a computer, waiting five hours to have a simulation done. The fact is that as much fun as that is… there are two different problems with it. 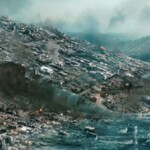 One is physical limitation, where obviously in a movie like this we are literally driving with a limo through this earthquake or flying with a plane through it. Just physical limitations with camera rigs, and trying to make that house, tree, building what ever it is break and fall at this correct timing. As well as have the camera drive through it; there are certain limitations to the motion control rigs that simply don’t allow us to get the shot the way we wanted. Also once you get that shot, you are stuck with exactly that. If the director comes up and says I don’t like the way the tree falls, it’s like sorry that’s how it is. With CG you can totally change that. The second thing is budgetary limitations. May sound weird on a movie like this but if you have a scene where an entire area of Los Angeles -obviously part of it would always be a matte painting- even the stuff that is close is an entire residential neighbor hood or an entire commercial street like Wilshire Blvd or all of downtown. If you had to build all of this as miniature and make it crumble and shoot it, it would become outrageously expensive and absolutely not possible to do. In the computer we can clone the houses, we build three or four and retexture, color and multiply them. There are a lot more options, trees the same thing if you build it as a miniature you have to build every single tree. Engel: My favorite example is of the limo driving away from us in a residential neighbor hood it’s also in the trailer; it’s a very quick cut in the trailer though. There is so much stuff going on in just the logistics of that; to look for a mile into the distance and see things shaking and crumble. Just to rig that as a miniature you would have to lay so many parts and composite it together. The triggering of say five hundred events that all have to work at hundred percent would be logistically impossible. Engel: It is a little bit of a mix, in the parking garage sequence there is a real car falling and smashing and one is tumbling over. At the same time the practical effects came in handy for everything where we had to interaction with the actors. That’s when Mike Vezina set up this big rig shaky floor that was six thousand square feet, so that the actors did not have to act like they were on a plate form that was wobbling. Wavy motion like a real earthquake was set up. When they went running from out of the house, the house was crumbling behind them, which was all CG, but they were literally running on this floor and getting into the limousine as the floor was shaking. Roland said as a mandate from the beginning “we can’t do like in the old Star Trek movies where they do the Shatner, where they hold on and act. As if the Enterprise is doing something like this”. Roland said “No, the actors have to have the fear on their face and it has to be real.” That is why that whole floor was built; which proved to have additional challenges for us later in post, like tracking. Is it cheaper to make a movie of this scale today with the current developments in the software? Engel: I recently had a discussion with somebody about that. It’s very fascinating that it is absolutely true that that is happening. The question that came up was can you do things cheaper with the software but at the same time while that is happening where the cost goes down the expectations go up. What you have to deliver with this movie it somewhere evens out. You are always on the same track with what you actually have to show and do. Weigert: Good point because after every project we think the next one is going to be so much easier because now we know how to do it. Then there is a whole new set of challenges because now everybody knows how to do it. We say we want to do something that nobody has seen before. You now are at the same point you were at two years ago, where you have to reinvent something new. Stretch the computing power and software to its absolute limits. If you look at any sequence in this movie there were horrendous render times. Horrendous simulation time and new software development time. Engel: There was a nice little statistic we did about computing time. It took days to render the early sequence of the earthquake. If we would render that on a single machine it would be sixteen years to actually do that. Weigert: If you think back, doubling up every eighteen months, wasn’t that long ago but eighteen years ago according to Moore’s law this would have been double that! It would have been thirty-two years and so on. You can think about how long this would have taken just ten years ago. It wouldn’t have been possible at all. A lot of the scenes we have done here wouldn’t have been possible five years ago. Engel: There were some new developments that were just happening when we were making the movie like Thinking Particles from Cebas, which we actually implemented. We actually worked with a company that built a plug in for 3D studio max. We said we need it earlier than you guys will have it finished. We actually made a deal with the company to hire additional programmers and whatever it takes to get it done early. Then they can use it for their official version. We have it to use on our movie, which nobody else had at that point. Can you tell us about working digitally and the pipeline that you developed for 2012? Engel: Our movie 2012 came along and was fully digital and this was the first time Roland Emmerich ever worked on a fully digital movie, previously he shot on film. Dean Semler being our DP loves to work with our genesis camera. Starting from that, we embraced it from the get go, we only worked digitally for the last ten years and haven’t touched film since. On a movie of this scale the flexibility that it gave us was just amazing. There was a huge service set up at Sony so that we could produce on this project. Weigert: We wanted to introduce an entirely digitally automated pipeline. We did this together with Sony Pictures; we built a 400-terabyte server that would store every digital frame that was ever shot. We would have automated tools that would convert the EDLs that editorial would send over, even if it was just a single shot. Or even if it was a sequence of a hundred and twelve shots it would immediately convert it into a XML format and send it over to that server and that sever would pull all those frames send them over to us and rename them based on our visual effects and conventions and pop them into the folder. It would notify us and the artists working on it that the shot is now there. That process would be literally two to three minutes. While if you did that with 35 ml you would have to pull the negative, clean it and scan it. Instead you send the drive over and rename it you put it in your folder. Weigert: It literally would just take a minute, to get those eight frames in. The compositor would get them in front and could extend it. That was a very powerful tool and we always tried to do a lot of automated tools to take the stupid work away from the artist. To let the artist really do what they do best which is making the shots or elements within the shot. It was also good for us because at the very end when you do a backup of these things or when we need to find making of stuff then we know exactly where it is because it is in our database through the whole process and it’s all correctly named. It’s very easy to find stuff and that helped alot. Engel: Sometimes when you work with so many companies and each company has its own way of working. It’s not so easy to get all this together and make it work together especially when we are the hub and everything goes through us. Eventually you have to make a system that makes files named the right way otherwise it’s being sent back. Weigert: We built software tools for that too that would work on Linux, Mac and PC. That we would give to every single company out there and they would run it. They would do a first run it through the tool and the tool would first check everything. Is the naming correct and so on and then send it over to us. Our system would ingest it and immediately send it over to the playback system. There was as little human interaction as possible on this because it is stupid work and if you could to have a computer do it then why not?